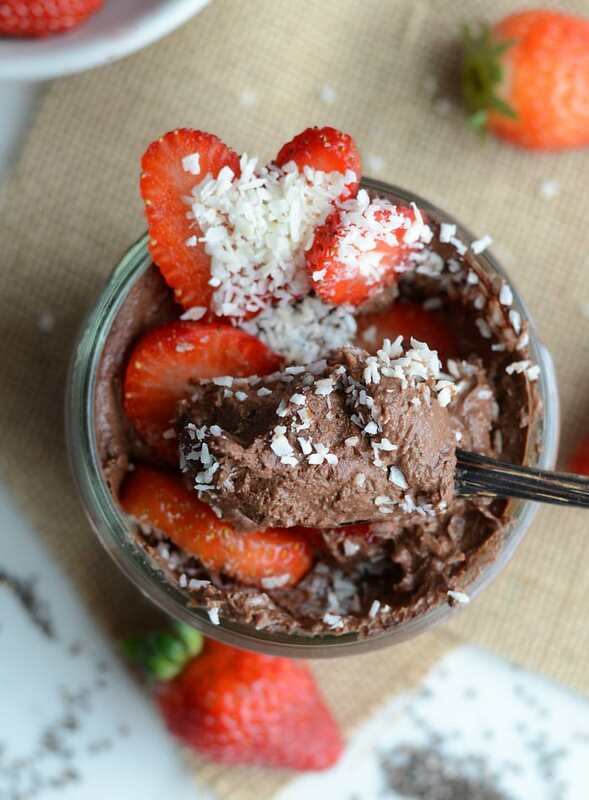 Chocolate Chia Protein Pudding | a nutritious high-protein treat! 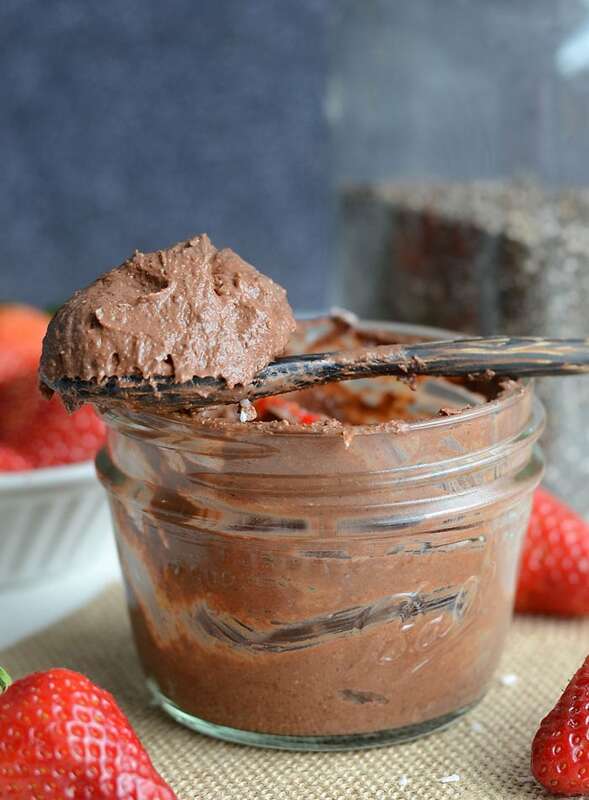 This Chocolate Chia Protein Pudding is light, smooth, thick and creamy just like delicious chocolate mousse. It takes just 2 minutes to prepare so before you know it’s you’ll be digging into this protein-packed, nutritious chia pudding that’s sure to be a new favourite! 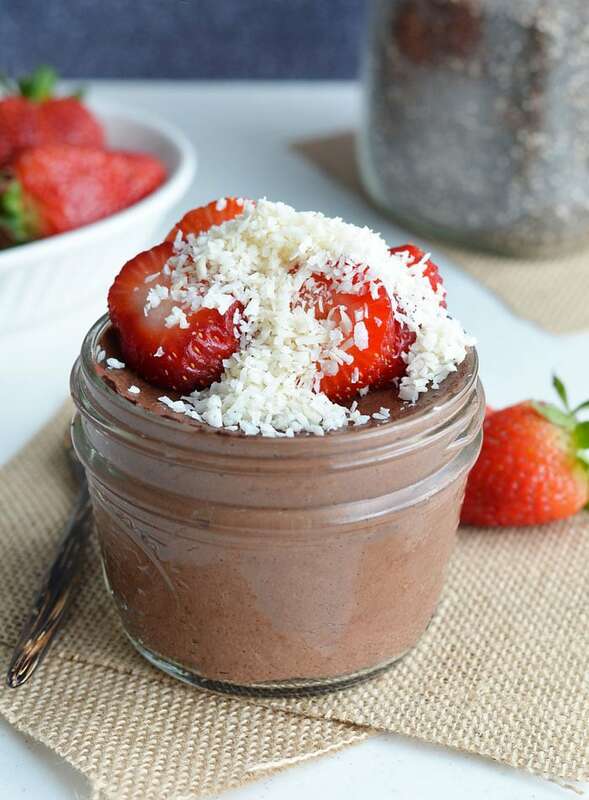 Who doesn’t want to eat chocolate chia protein pudding for breakfast? I love waking up to this decadent, smooth and creamy pudding! It makes hopping out of bed first thing in the morning a breeze! With the addition of vegan chocolate protein powder, this chia pudding is very high in protein and with the added fats from the chia seeds and topped with sliced fruit for carbohydrates, you have a nicely balanced breakfast. The thing I love most about chia pudding is there are endless varieties so you never get bored. This version is really quick and easy and makes a delicious, healthy dessert, or a quick breakfast or snack anytime. Simply blend it and stick it in the fridge to set. The pudding itself is super creamy and thick, thanks to the magic powers of chia seeds but the best thing about it is it’s the perfect vessel for all your favourite toppings! Try these chia pudding toppings! 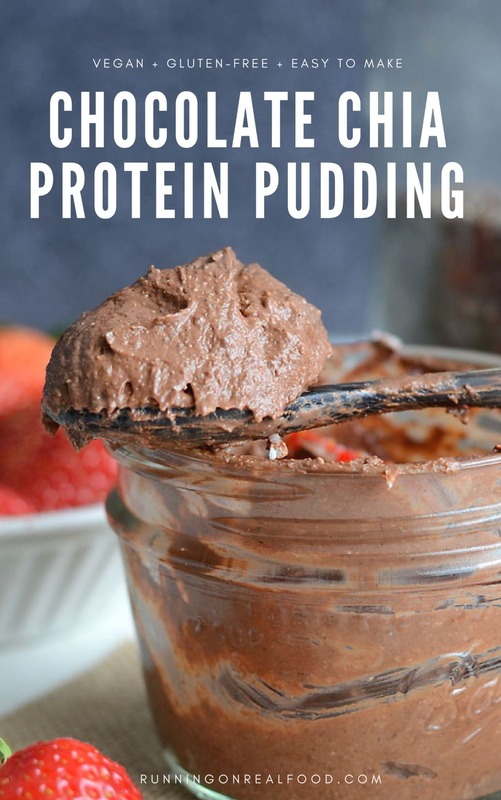 This pudding is nutritious on it’s own but you can add even more antioxidants, vitamins an minerals by adding optional superfood powders to the recipe. These superfood powders are potent so you only need a small amount, try 1/2 – 1 tsp to start and only use 1 or 2 at a time. You shouldn’t taste them in the recipe if you just add a small amount. A couple of good combinations to try are maca and lucuma, turmeric and ginger, maqui berry and camu camu or chaga mushroom and raw cacao. I don’t have all of these on hand at all times, otherwise I’d have no money left!..but I do like to keep a few of them on rotation for all the health benefits they offer. I regularly use mushroom powder, maca, cacao, turmeric and spirulina and I buy and use the others occasionally. You guys will love the thick and creamy texture of this pudding and the taste is amazing too. It’s one of my favourite treats! Sweetening: You can leave out the additional sweetener as the protein powder does add some sweetness but I usually add 2 packets of stevia to mine, alternative you can add 1 tablespoon of maple syrup, raw honey, brown rice syrup or agave for added sweetness. Blending: If you don’t have a blender you can make this recipe without one. To make without blending, mix all the ingredients together in a bowl until well combined and refrigerate until set. I much prefer this recipe blended though as the result is a much smoother, creamier pudding. Protein Powder: I make this recipe with Vega Chocolate Performance Protein and I haven’t tried it with anything else. Any pea protein-based protein powder should produce the same result. I like the texture and flavour of Vega for this recipe. I used a whole scoop, or one single-serve packet (44 g) but you could always reduce the amount used if you prefer. If you use less, just reduce the amount of liquid used. 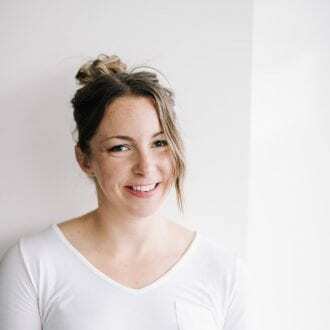 Liquid: I like to make this recipe with homemade nut milk or store-bought almond or cashew milk. It can also be made with light or full-fat canned coconut milk which is amazing but a little bit high in calories to be eating day-to-day. If you’re making this for a special dessert, go ahead and use the full-fat coconut milk! If you’re really in a pinch, you can also make it with water but my go-to is store-bought unsweetened almond milk. 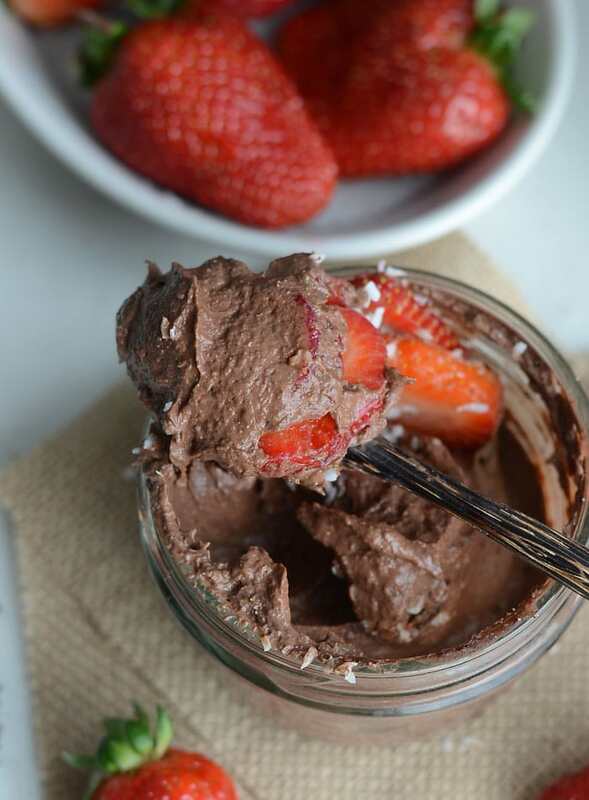 This chocolate chia protein pudding is so creamy and velvety, it’s hard to beleive you’re eating something healthy. Try this loaded with your favourite healthy toppings for breakfast or with coconut whip creamy and chocolate chips for a decadent but nourishing dessert. It makes a great snack on-the-go too! Add the milk to the blender first, then add the chia seeds and blend for about 30 seconds. Add the rest of the ingredients to the blender. Blend until very smooth and creamy, adding a bit of extra milk if it’s too thick to blend. Scoop the mixture into a container or bowl and place in the fridge for at least 60 minutes up to overnight. I feel like I need to try this with the new mocha flavour!! Love that Vega One is soy-free! So many companies are selling-out and adding soy to their protein powders and fooling consumers because it’s way cheaper! Looks yummy! To be honest, I tried Vega recovery powder awhile back and hated the taste, so I’ve shied away from their protein powders as well… but maybe I’ll have to give it a shot! Nope. Just add all ingredients to the blender and mix until thick and creamy. Then let it sit for at least an hour or up to overnight. Mine had a really bitter taste! I remembered chia sometimes left a bitter taste in some of my other encounters, but I did a few different batches to make sure of the culprit….protein powder, cacao, or chia. Mine seems to be from the blended Chia. I tried several batches, the one where I didn’t blend them & just stirred them in at the end had no bitter taste. Maybe it’s the chia seeds I’m using (the Whole Foods 365 brand)…..Have you had the bitter problem? Hmm, interesting. I’ve never had chia seeds be bitter before, whether I blend them or not. Are you using flavoured protein powder? If not, are you using a sweetener since cacao is very bitter?? I guess it could be the chia seeds, but I’ve never heard of that before. Anyhow..the recipe still works if you don’t blend it. Thanks! I have had this problem, it means your chia seeds have gone bad and you need new ones. Hello! I’m not vegan and usually use whey protein powders, would those recipe work fine with a chocolate whey protein powder? Yes, that will work fine. Enjoy. Thanks! I ended up making it today and it tastes incredible, however my chia seeds didn’t go smooth like yours did even though I blended it… would using ground seeds make it more mousse like yours? I used whole chia seeds in mine and it came out really smooth just with blending. It could be your blender maybe? I used a single-serve blender cup so it was really able to blend those seeds up! Ground chia would work I guess, but I haven’t tried them. You could always try just adding the chia seeds first and pulsing them a few times to break them down before you add the rest of the ingredients. Delicious. This will be an all time favourite. Any idea on nutritional info? I’m sorry, I don’t have it for this recipe but it should be easy to calculate by entering it into MyFitnessPal or other nutritional info calculator. Can this be made without the protein powder? Hi Samantha, I haven’t tried this recipe without protein but you could just blend the chia seeds, liquid, cocoa powder and sweetener, you may need to adjust the amounts a bit. Add the chia seeds and cocoa powder and a bit of liquid, then adjust the sweetener to taste and add additional liquid as needed to create a thick texture. hope that helps! You are very welcome. Glad you enjoyed it. You can keep it in the fridge for a couple days, maybe up to 3…I haven’t kept it that long but it should be ok! I didn’t have cocoa powder, so I substituted cacao nibs and used a half tbs maple syrup for my sweetener. Absolutely delicious!! Glad you enjoyed it! It’s such an easy, yummy recipe, isn’t it? Best chia pudding i’ve made, it’s so much nicer and thicker when blended too! What are the nutritional values? I’ll have to update that. I’ll let you know when I do! It will depend on the protein powder you use but it will be roughly 30 grams of protein with some fat and carb.